When you are considering nursing home care for yourself or your loved one, your head might be spinning. Knowing the important nursing home questions and how to ask them is detrimental to ensuring that you're getting the best quality care. You also need to understand red flag answers. Take a deep breath and use these important questions for nursing home staff as a guide to find the best possible care. Younger and healthier seniors will likely want to ask more questions regarding social activities and active lifestyles in senior housing while family members of seniors requiring higher levels of care will want to know more about what is offered to residents who are bedridden or dealing with medical issues. Start by asking basic questions based on your needs. Is this a Medicare or Medicaid-certified facility? Do you specialize in certain conditions, such as dementia or Alzheimer's? Do you provide short-term or long-term care? Are you accepting new residents? Is this a skilled-nursing facility, and if so is a skilled bed currently available to you? Is the facility and its director licensed? Is there a special services unit? Finances do play into selecting a facility. Ask for a written fee schedule and be sure to ask the following financial questions. What is the cost, and how does the payment plan work? What is included in the fee schedule? What are the services that require an extra charge? Will Medicare/Medicaid cover any part of the fees? If Medicare and Medicaid do provide coverage, how much will they provide and for how long? Do you bill Medicare and Medicaid? How do you provide notice when fees change? You'll want to ask some general questions about both the facility and the staff. Are tours of the facility available? Do you conduct background checks for all employees? Does the facility meet federal and state requirements? What is the background training of the staff? What are the ongoing training requirements of your staff? What is your staff turnover rate? How many residents live at the facility? What is the average age of residents? How often do nurses make the rounds? Do you work with outside volunteer units? If so, how are they screened and what types of things do they do? Are volunteers given a criminal background check? How many of each type of medical personnel are available on each shift (MDs, RNs, CNAs, etc.)? Is there a social worker who regularly visits with residents? If possible, try to learn how comfortable and well-cared for residents are at the facility when you visit. You can observe a great deal on your visit, but the following questions will help round out your observations. What are some of the most common complaints of residents? How is the noise level? How do the residents rate the food? Is it gourmet or more standard? Does a nutritionist design or approve the menu? What types of activities do you offer residents? Are outdoor spaces available for resident activities and visits? Do residents have a choice of foods at mealtime or is there just one meal offering? Can family visit at mealtimes? Do residents have access to telephones and television? Can pets visit or live in the facility? Do you have a place where residents can enjoy family parties or meals? Is there an activity room available for use even when activities aren't scheduled? What do you do for holidays and special events? What is the noise level in the rooms? How many residents live in each room? What types of home comforts are provided? Are there regular group activities for residents? Can residents make choices about their daily routine, such as when to wake up, go to bed, or participate in activities? Quality of care questions can help you determine whether the facility is a good fit based on specific needs. Can residents continue to see personal care physicians? Do residents have the same caregiver most days? Do you have arrangements for emergencies with a hospital that is close by? Do you have family and resident councils independent of management? Do you hold regular care planning meetings for family and health care providers? Which employees are involved in care planning for residents? Are they the same as those providing care? Who is involved in decision making about using restraints on residents? How are those decisions made? When restraints are used, how often are they removed so residents can move around? Does staff help restrained residents move around when they ask? How do you prevent pressure sores for bedridden residents? What steps do you take to prevent bowel and bladder incontinence for residents at risk? How do you handle residents displaying behavioral symptoms? What types of preventive health care do you provide residents? How do you work with the local long-term care ombudsman? What type of medical assistance is available? Are there medical doctors on staff? Is there any staff training for preventing abuse in elderly care homes? How often will the senior be checked on? Are there any simple exercises offered for arthritis? What is the age of the oldest resident? What other types of medical facilities (physical therapy, etc.) are available on premises? Resident safety is of utmost importance. Ask the following question to ensure safety protocols are in place. Are there handrails in the hallways? Are there grab bars in bathrooms? Are all exits clearly marked? Do you have a backup power supply for patients who need to use machines? Where are smoke detectors installed and how often are they tested? Do you have fire sprinklers? What is your emergency evacuation plan? Is the staff trained in appropriate evacuation techniques? Do you have enough staff on hand at all times to ensure quick evacuation of all residents in case of an emergency? Can I see a copy of your most recent nursing home inspection? Have deficiencies on the inspection been corrected? What measures do you take to protect residents' belongings? Do you have your own hospital transport? How long does it take on average for an ambulance to reach you? What type of emergency training does staff have? Some answers may be red flags that warrant further investigation or even suggest the facility is not a safe one for seniors. Proceed with caution if you discover any of the following when you are talking with facilities. How long has the average employee been here? Look for nursing homes that have staff who have been there for several years. If the average time of employment is less than a year or two, it may be a red flag requiring further investigation. If the facility doesn't welcome tours or staff seem hesitant to provide one, this may be a concern. Unwillingness to provide a tour may indicate the facility is attempting to hide signs of abuse or neglect. If a facility doesn't allow family and friends to visit with residents without a staff member present, this may be a warning that staff is attempting to manipulate residents into not disclosing abuse or neglect. Very short windows for visiting is another red flag. Look for facilities with generous visiting hours that allow visitors access throughout the day on a drop in basis. While most states regulate staff to resident ratio in nursing homes, be aware of those that seem to only have minimum ratios. Studies show a higher staff to patient ratio equals a better quality of care in nursing facilities. Criminal background checks are essential for resident safety, so if the facility answers no to questions about background checks, it is definitely a red flag. Thoroughly checking out the nursing home you are considering is an important step for choosing the facility that is the right fit and meets your needs. 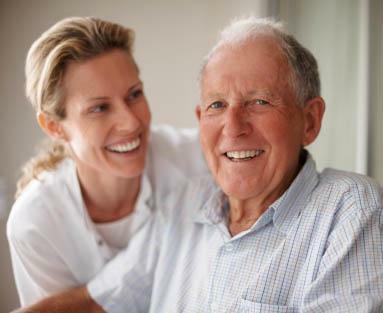 Whether it's for long-term or short-term care, make sure the location is comfortable and suitable for the senior. Make sure all of your questions are answered and that the answers are acceptable. This will give you both peace of mind and the assurance that the care and medical response of the staff are first-rate. Knowing the facility is taking good care of its residents is the best way to ensure peace of mind for the new resident as well as all family members and close friends.